The following are the main stories in Sunday's newspapers. The Sunday Times of Malta says the PN’s treasurer warned party leader Adrian Delia last summer that finances would run dry by next month. 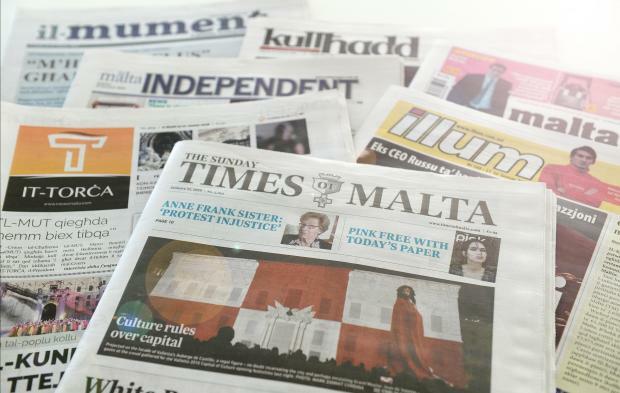 In another story, the newspaper says another member of the judiciary will be asked to probe the Panama Papers scandal after former Opposition leader Simon Busuttil’s request for an inquiry was turned down last week. The newspaper also says the government has granted unlimited rights to the Corinthia Group to reclaim the seabed around the peninsula it occupies at St George’s Bay and build on it. It-Torċa also leads with a story on the PN’s financial problems. Malta Today says Corinthia will replace hotels with 12 tower blocks. The Malta Independent on Sunday says the government is unwilling to use its veto power to force a solution on migration. Illum says Beppe Fenech Adami voted against Adrian Delia in a confidence vote called by the party’s College of Councillors. Il-Mument quotes party leader Adrian Delia saying he was in politics to change the country and the party and improve the people’s lives.